Happy Campers: Arriving at Camp CEO and being greeted by my mentee, Trinity. Last week I participated in what will surely be remembered as one of the highlights of my summer–camping with the Girl Scouts! In it’s tenth year, Camp CEO is a premier leadership camp for teen girls and high-level professionals held at Camp Butternut Springs in Valparaiso, Indiana. I was invited to attend as one of the 25 female “CEOs” along with 40 high-achieving Girl Scouts selected from the Greater Chicago and Northwest Indiana Council who applied and wrote essays to participate. I had not been camping since my days as a leader with my daughter’s troop 20 years ago, and it was incredible fun to be hiking, swimming, and singing songs around the campfire once again. In addition to these traditional camp activities, what made Camp CEO so special was the opportunity to mentor the girls one-on-one and share stories, life experiences, advice and inspiration. I was fortunate to be paired with Trinity, an impressively smart and sweet girl from Chicago who aspires to be a doctor. I really enjoyed spending time with my mentee as well as all the girls at camp and I was continually amazed by the thoughtful questions the girls asked. They were truly focused on learning and absorbing as much as possible from their time with the adult mentors. Women were present from a wide variety of professions such as science, technology, law, government, finance, communications, entrepreneurs, and more. I was asked to lead a workshop on networking and social etiquette in politics, which challenged me to step out of my box a bit to design a seminar. But I had a ball doing it, and the girls really seemed to enjoy discussing the role of women in elected office particularly in light of the history being made this year in our U. S. Presidential race. One activity that seemed to really resonate with adults and girls alike was the “Dreaming Your Future” tradition. A couple of times each day, everyone would gather around the fireplace or campfire, and listen as three or four of the CEOs took center stage and shared their own life story and pathway to leadership. As usual, the girls had intriguing questions to ask. I found it so interesting that every woman’s story showcased the fact that most of us are not doing what we thought our careers would be when we were in high school or college–in most cases our journey has taken twists and turns to lead us to a place we never dreamed possible. I know that I never planned on becoming a Village President when I was majoring in Foods-Nutrition/Dietetics during my college days! As luck would have it, the day I chose to arrive at camp, August 10th, just happened to be National S’mores Day–score!! Who knew it was a thing? But I cannot imagine a better place on earth to be on National S’mores Day than at Girl Scout Camp! We celebrated with a fabulous bonfire, singalong, marshmallows toasted on sticks, and a few mosquitoes to complete the woodsy atmosphere. I discovered a new taste sensation–using a peanut butter cup sandwiched between the graham crackers and marshmallow, in place of the traditional plain chocolate bar. I am still thinking about how delicious that tasted–maybe the fresh air and female empowerment are enhancing the memory? Camp CEO was an all-around wonderful experience. I’m grateful that we have organizations such as Girl Scouts to provide opportunities like this, which bond women and girls together to inspire the next generation of leaders. But the inspiration works both ways, because I came home uplifted by Trinity and all the other young women I now know who give me hope for a bright future for us all. Adding our hopes and wishes to the “Dreaming Your Future” dream-catcher at Camp CEO. It is a testament to our ecological stewardship in Long Grove that we still have many varieties of native wildflowers that bloom in public and private woodlands and open spaces. In fact, we even have one variety that is a federally protected endangered species. I have never seen the white fringed prairie orchid, but State officials assure us it is here and have kept the site location confidential. Just one more way in which our Village is rare and special. This flower has been recently under attack in our boardroom, as the private property owners try to rally Village support against the State’s attempts to further protect this endangered species. Do we side with the residents or the flower? Should the Village be involved at all? Some on the Board are critical of the State and dismissive of the ecological concerns. Emotions are high and accusations have been made. It has gotten so ridiculous that at the recent Village Board meeting one Trustee suggested that if it were his property, he might just take care of the problem with the use of some “agent orange.” Seriously? I am in solidarity with the environmentalists, and spoke up in defense of the flower. After all, isn’t it a resident too? This species has been blooming in Long Grove for more years than I have, and has been protected by the State at this location for decades. The experts at the U.S. Fish and Wildlife Service and the Illinois Nature Preserve Agency have studied the situation for many years and determined the best course of action for the collective greater good. The owners of the piece of property where the orchid lives beg to differ. There are other factors at play in this; for brevity and confidentiality I have simplified the issue. But in the end, it all comes down to money. And if that doesn’t work, well, the State has something as a last resort called eminent domain. Never underestimate the power of a flower. Just a small portion of the beautiful gardens created by Jo and Harry Moser of Kildeer. Today the members of the Long Grove-Kildeer Garden Club brought a little bit of beauty and joy into the lives of others. Five area private gardens were open to the public for tours this morning, to share the wonders of nature and raise a bit of money in the process. Whenever I attend this event I invariably come away with creative ideas and inspiration, and also a healthy dose of garden-envy. We have some seriously talented (and hard working) gardeners in our corner of Lake County! The gardens featured this year in the annual Garden Walk were quite diverse and unique: vegetable gardens, unusual flowers, water features, a serene Japanese garden, fruit trees and berries, wildflowers, orchids, cactus, a garden shed to die for and even a couple of fairy gardens–we saw it all. Thankfully, Mother Nature set a perfect scene today for the gardens in all their glory. By volunteering and participating in this event I was once again reminded of the best things our Village has to offer. Neighbors working together for a common goal were raising money for scholarships and stewardship work in our public Woodland and open spaces. And in the process, showcasing some outstanding gardens and those who create them; providing beauty and inspiration to fellow green thumbs in our community. 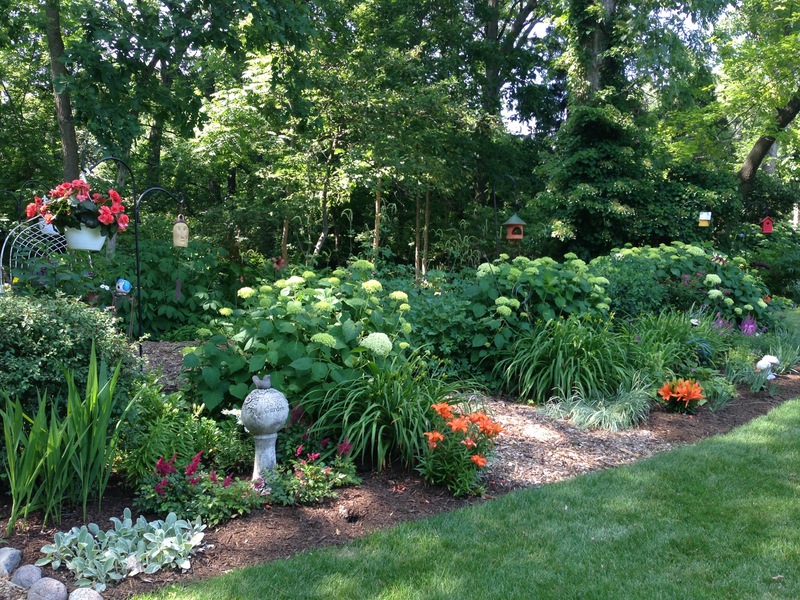 Our local garden club is a real asset to Long Grove all year round, but in the summer it truly shines the brightest. 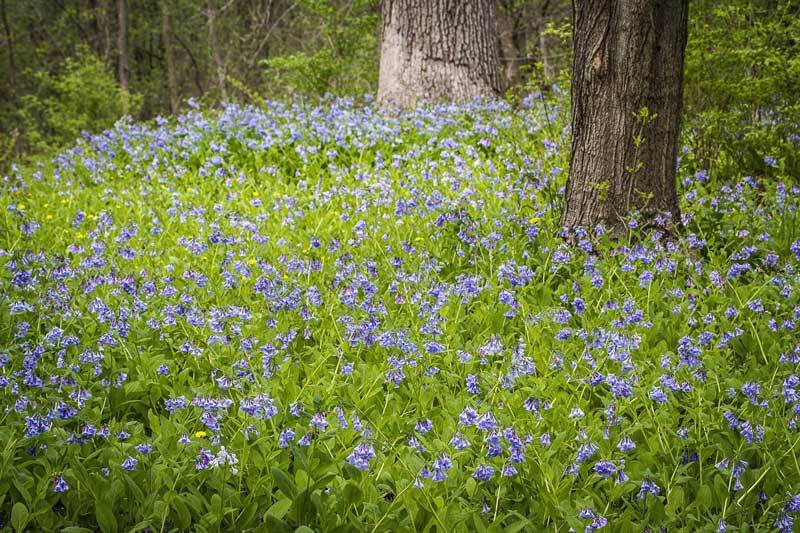 Beautiful flowers such as these bluebells carpet the ground this time of year at Reed-Turner Woodland in Long Grove. Last Friday marked the end of a hectic workweek, and I needed to go someplace to relax and mull over a few Village concerns tossing about in my mind. Since it was about as perfect of a Spring day as we get here in Long Grove, I decided to take a stroll through one of my favorite places–Reed Turner Woodland Nature Preserve. Early May is an ideal time to experience this local treasure because a majority of the native Illinois wildflowers are in bloom and it is simply glorious! With the redbud trees flowering alongside the phlox, violets, and Virginia bluebells, the palette of purples at the moment is stunning. Some of the other woodland varieties that I spotted blooming right now include: trout lily, jack-in-the-pulpit, May-apples, and red and white trillium. Several years ago, resident Kathy Wiberg trained me to be a guide at the preserve so that I could lead groups on field trips, and to this day I appreciate knowing the names and stories of so many wonders to be found in the woodland. But to me, the greater beauty of Reed-Turner Woodland is intangible; it’s not the flowers but rather the serenity of the setting. The first visit I make in the Spring always gob-smacks me with the grandeur of nature and my own insignificance. I came to the preserve this particular day to let the woodland comfort me and to be reminded why I love Long Grove so much. At times, that can be a challenge. I have a favorite bench that sits up high on the ravine, overlooking the curving creekbed below. Our recent Spring rains have left a gentle but steady flow of water over the rocks and fallen limbs, and the murmur of this never fails to soothe my soul. For me, this is a tranquil place where I sometimes ask silent questions. And if I can calm my mind enough to allow peace to come, I will usually hear some answers. This 36 acres of high quality biological diversity was given to the community many years ago by the Reed-Turner family and in the 1980’s was dedicated as an Illinois State Nature Preserve. The property is currently maintained and restored by the Long Grove Park District, with Barbara Reed-Turner still leading the way for preservation with her ongoing spirit and love for the land. When I need some personal inspiration to keep going, she is one of the residents that I most often think of. This coming weekend, May 14th and 15th, the Long Grove & Kildeer Garden Club will be holding their annual native plant sale at the log-cabin Nature Center located at Reed-Turner. In addition to knowing that you are supporting the major fundraiser for our local community group (which sponsors a Stevenson High School scholarship and paid summer internships at the Woodland), you can rest assured that the plants for sale will work in your Northern Illinois yard, because they all come from local gardens. If you are interested in visiting the plant sale (I’ll be working on Sunday from 10-12–come say hello!) or strolling the woodland trails, Reed-Turner Woodland Nature Preserve is located at 3849 Old McHenry Road, in Long Grove. For hours and more information please call 847-438-4743. Conserve Lake County staff members Greg Rajsky (left) and Sarah Surroz (right) pictured with me at the April 20th Annual Meeting. Happy Earth Day! As we mark this yearly observance, I would like to share with you the story of a recent challenge that I accepted on behalf of the Long Grove Village Board, our residents, and myself personally. Conserve Lake County is an organization of committed people who believe that by working together we can protect, preserve and enhance our Lake County land, water, and wildlife in ways that will improve our lives now and in the years to come. This group made up of individuals, families, homeowner associations, companies, corporations, municipalities, and schools recently held their Annual Meeting this past Wednesday evening at Independence Grove Forest Preserve. One of the themes of the night was the challenge, “How will YOU conserve Lake County in 2016?” I was one of four local leaders asked to accept the challenge and speak to the 250 attendees about my organization’s plans. One of the benefits Conserve Lake County offers is on-site consultations and resources to assist private property owners in environmental stewardship. Advice is given to help residents maintain their properties so that they support clean water, rich soil, and resilient ecosystems. Properties that meet these guidelines can become certified through the Conservation@Home program. Our Village of Long Grove has taken measures over the years to preserve many of our native prairies, wetlands and forests in conservancy easements on private property, as well as in dedicated public open spaces. To encourage our residents to maintain this legacy, the Village Board recently voted to reimburse half the cost to any of our property owners who participate in the Conservation@Home program in 2016. Our community members have long been considered leaders in conservation and the potential for properties to become certified is significant. I believe we are up to the challenge! I also believe that it makes a more powerful statement if we can lead by example. So to that end, my husband Aaron and I are accepting the challenge to work towards getting our own 9 acres of property in Long Grove certified this year. We made this public commitment not only to help bring attention to a worthy endeavor, but because we feel it is one more way to show our appreciation and respect for the natural beauty of the community that we are fortunate enough to live in. At the conclusion of the meeting it was lovely to meet several Long Grove residents also attending, who I had not previously known. They thanked me for accepting the challenge on their behalf, and are also working towards getting their own properties certified. When like-minded individuals with a love of nature work together, great things can happen! What Do We Love About Long Grove? Seeing the sunny daffodils bloom each spring along the right-of-ways and getting free bulbs to plant each fall. Witnessing a huge herd of deer bounding through the snow in the backyard. Christmas lights on the covered bridge. Open spaces that sport native and sometimes rare prairie wildflowers. Knowing that Sunset Foods donates a little bit more to our local school districts each time we use cloth or reusable bags. Having a drink at a tavern that has been in continual operation since the 1800’s. Enjoying beautiful music on Towner Green on Sunday afternoons in the summer. Friendly neighbors who share our “Long Grovian” tendencies. Neighborhood walking trails and nature preserves we can use everyday. Schools that prepare our children for the future with a high quality education. Safe and tidy neighborhoods and volunteers who step up to keep them that way. I hope your tail is wagging with many, many more reasons to love Long Grove. My favorite walking buddy, Aaron Underwood, tests out the new pathway segment. With the recent completion of another trail segment, our Long Grove pathway system is one step closer to making a connection to Buffalo Creek Forest Preserve. Several years ago, when the sewer lines were put in for the Menard’s development, the Village took the opportunity to have a pathway installed on South Schaeffer Road. This north-south path runs almost the whole southern length of our village, and is considered a “spine” in the system to eventually link all neighborhoods to the historic downtown. Starting at Schaeffer Road and Route 53, the path had previously ended at Checker Road. The plan has been for this path to connect into the Lake County Forest Preserves pathways at Buffalo Creek, but making that final connection has proven very costly. Surprisingly, pathways are very expensive to engineer and construct–it’s almost like building mini roads. This is why most paths are created as part of a new housing development, or added by taking advantage of the opportunities created when roads are widened or infrastructure added. The Village had applied and received some grant money from the State of Illinois, but it was only enough to get halfway there with the connection. By working with our counterparts on the Lake County Forest Preserves Board, we have been able to partner with them and they have committed to adding a path that connects where ours currently ends, linking the Village system with the one in Buffalo Creek. So even though the path currently looks like it dead-ends halfway, it will eventually connect to the Forest Preserve when they undertake their enhancements. Pathways are one feature that our residents consistently advocate for, and we have a Village Pathways Committee that meets monthly to make headway on this initiative. This weekend, my husband and I went out to check out the new path and give it a spin. We’re getting closer to making that final connection to the Forest Preserve, one step at a time! Is it Lawn or is it Prairie? Open space in Long Grove this time of year features many wildflowers and native prairie plants. Most municipalities have rules and regulations regarding property maintenance and in particular, standards for keeping a tidy yard. But Long Grove is not like most municipalities. Our community includes many acres of forest preserve, park district lands, and platted conservancy, which are protected through county and state regulations. In addition to this, many privately owned lots in our Village have been partially or fully maintained as open space prairie. Residents have seeded these areas with native plants, and hold the occasional controlled burns suggested for best management. Many of these natural areas are adjoining platted conservancy, so that there is no distinction where lawn ends and open space begins. Nevertheless, I was surprised to learn this summer that we have an ordinance restricting the height of grass and weeds on private property to 8 inches. Prior to 2009, this rule did not exist, due to the unique nature of our local open spaces as described above. But after the economic crash in 2008 and the subsequent default of properties to banks and other agencies, exterior property maintenance became a concern. The “tall grass” restriction has been successfully used by our staff to keep vacant properties from becoming an eyesore, in the few instances where it was needed. Until recently. Disputes between neighbors happen, even in friendly towns like Long Grove. Complaints ensued, and unfortunately this ordinance was used to force a resident to mow a large unbuilt lot that was being maintained as open space. As a result, our Village Board took a look at this rule at our past meeting, with an eye on making it more compatible with the character of our community. When is it a lawn, and when is it a prairie? Is Long Grove a better place with less milkweed for the monarchs to find? We will revisit the distinctions on our upcoming agenda, with the goal being to craft standards that can be more practically applied. I do know one thing. Lawn or prairie, the wildflowers they contain this time of year are gorgeous! Girl Scout Erin McDermott in the butterfly garden she has created at Reed Turner. One of the more enjoyable things that I get to do as Village President is to recognize students for their achievements. Today I was honored to meet Erin McDermott, who is completing her Gold Award project for Girl Scouts here in Long Grove at Reed Turner Woodland and Nature Center. Many of us are familiar with the Eagle Scout award in Boy Scouting. The Girl Scout Gold Award is the highest honor that can be achieved, and 2016 marks it’s 100th anniversary. 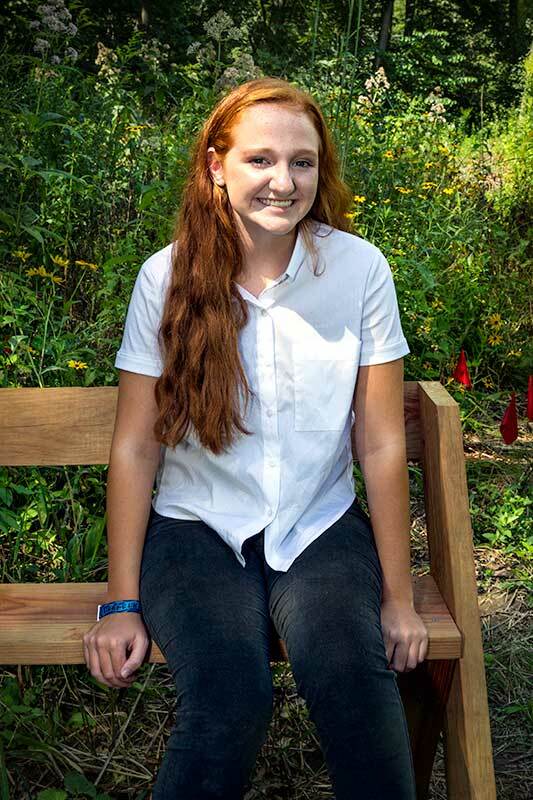 For Erin’s project, she chose to restore a prairie and install a butterfly garden and sitting area at the Woodland. This afternoon she held a ribbon cutting ceremony, education session, and open house to unveil the restored garden to the public. I was lucky enough to get a personal tour by Erin, and see the beautiful wildflowers and benches she has created on which to sit and contemplate nature. It is a great enhancement to an already wonderful community treasure. In today’s world, our kids have so many choices about how they want to spend their time. I want to thank Erin for giving of her time to make our community a little bit better. I was happy today to congratulate her for sharing what she has learned, and for her recent accomplishments. And, I will be making some trips back in the months ahead to check for more butterflies! Photo of a wild turkey taken this spring in a Long Grove backyard. Having lived in Long Grove for 17 years now, I’ve had many different types of strange and exciting wildlife encounters. One creature that I have not seen yet, however, is a wild turkey. Recently, fellow resident and friend Jodi Smith posted a picture on facebook of a just such a bird, strutting across her back yard, near the forest preserve. So cool, and certainly something that we don’t see every day! I used to sometimes see red foxes cutting through our neighborhood, and I have also spotted the occasional weasel. Living close to a creek means that I’ve encountered a number of snapping turtles over the years, and some of them have been as large as a dinner plate. One spring, a momma snapper crawled up the creek bed into my next-door neighbor’s yard and laid her eggs in a nest that she dug overnight. It just happened to be near the bus stop for Country Meadows, so the kids and moms alike were entertained watching her industrious labor. Later in September, the eggs hatched and we were again treated to the bus stop spectacle of many, many tiny baby turtles emerging from a hole in the ground to march, one by one, back down to the creek. How did they instinctively know the way? Another one of nature’s mysteries, I guess. Deer and coyotes are common visitors to many of our Long Grove properties, and sometimes they co-exist peacefully, sometimes not. About ten years ago, I looked out my family room window to discover a newborn fawn, curled up under a tree in our back yard. It was Memorial Day weekend, and we watched and worried over that baby from a distance, as it seemed like the mother was never around and had possibly abandoned him. I have since learned that this is a common behavior for the doe to forage and leave the newborn fawn alone for long time periods. Eventually momma deer did shown up, and off they went into the woods. But it was not so happily-ever-after. Because of the warm weekend we slept with the windows open, only to be awakened at dawn the following day by the most blood-curdling braying sounds coming from the tree line next to our yard. A large coyote had the fawn by the neck and was carrying it off across our back yard! I screamed and the coyote dropped the fawn right next to our patio. In retrospect, maybe the coyote was a mother too, just trying to rustle up some breakfast for her children, but at the time I was more concerned with my young children waking up and having to see a dead fawn outside the kitchen window. Then something miraculous happened. As my husband was getting ready to relocate the carcass, the fawn seemingly rose from the dead, shook his head, and stumbled off into the woods to live another day. All that summer, we saw the same fawn and his mother hanging around our yard, and we enjoyed watching him grow. We named them Jesus and Mary. Jesus graciously thanked me for saving his life by eating my hostas, roses, and daylilies! Sometimes our wildlife gets a little too close for comfort, as we discovered one spring when a raccoon decided that our attic would be the perfect spot to set up her nursery. Telltale sounds in the night led my husband to set up video cameras to survey the nocturnal goings-on. Yes, the joyous sight of a mother raccoon and her babies was captured on film for us to enjoy. I will never forget the fun of being in Arizona with the family for Spring Break, and watching footage of momma raccoon wiggle and shimmy her furry backside into a tiny hole in our shake shingle roof in Long Grove. The wildlife “experts” that we hired to relocate the varmints conveniently left their ladder against our roof for easy overnight critter access. Party at the Underwood’s while they are out of town! We even posted a video of it on youtube—raccoons are REALLY good at climbing a ladder. Despite the occasional crazy mishap with our local creatures, I really do love being where the wild things are. One of the joys of living in our Village is having the opportunity to observe nature up close and personal. Wildlife can be unpredictable, but also endlessly fascinating.